This school year, with all three boys in school for portions of each day, has been what some might call ‘a bust’. In true Nicola-fashion, I entered the arrangement without giving much thought to it, then for a fleeting moment (likely after dropping off the boys that first morning) I decided it was going to change my life, only to realize five seconds later that it was going to do no such thing. In theory – in exchange for six years of hard labor – I was to have eight hours of childless time per week. (If you’re doing the math, that’s a return of approximately 1.3 hours per week for every year of labor.) Eight hours that were quickly subsumed by classroom volunteering, no-school-days, and a few coffee shop visits. I also imagined, from these life-changing eight hours, the professor and I could have weekly coffee dates on one of the mornings he didn’t have to teach. Like Tuesdays with Morrie, even though I never actually read the book. This happened exactly three times in the span of four months. Last Tuesday, an hour before we were due to get Percy at Kindergarten, the professor suggested we go for a walk in Edworthy Park. Entirely for my benefit, since no one in our nuclear family unit cares to spend time out of doors. The professor will say ‘I like going for walks, I just don’t like going for walks with the boys,’ but this is entirely false, I concluded on Tuesday – after spending 30 minutes outside with him. He might enjoy a walk without children….in August…..for fifteen minutes. But at any other time? Notsomuch. 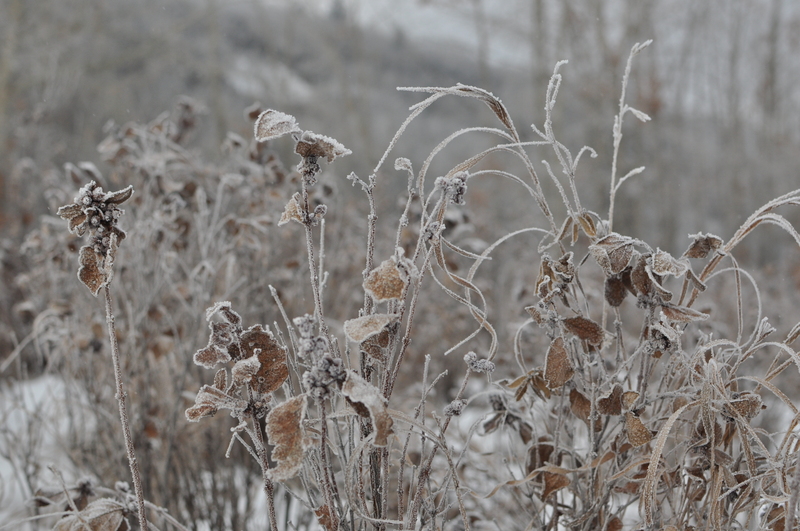 It was one of those mornings in Calgary that come around a few times each winter – the trees and grass all covered with spindly bits of ice. It’s fairly magnificent if you’re into that whole natural beauty thing. And, in true Calgary form, it was also deceptively cold once we left the confines of our crescent. We pulled into the parking lot and quickly learned the surface was basically a very thin ice skating rink. Like a couple of retirees, we shuffled towards the pathway, clinging to one another in an attempt to keep from breaking a hip or shattering an elbow. After avoiding most of the ice, we stopped in front of a tree – not unlike a sixtysomething couple I observed in Fish Creek Park some time ago – watching while a flock of finches darted in and out of the branches. ‘Once I’m out, I’m out,’ I shrugged, stuffing my bare hands deeper into my pockets. 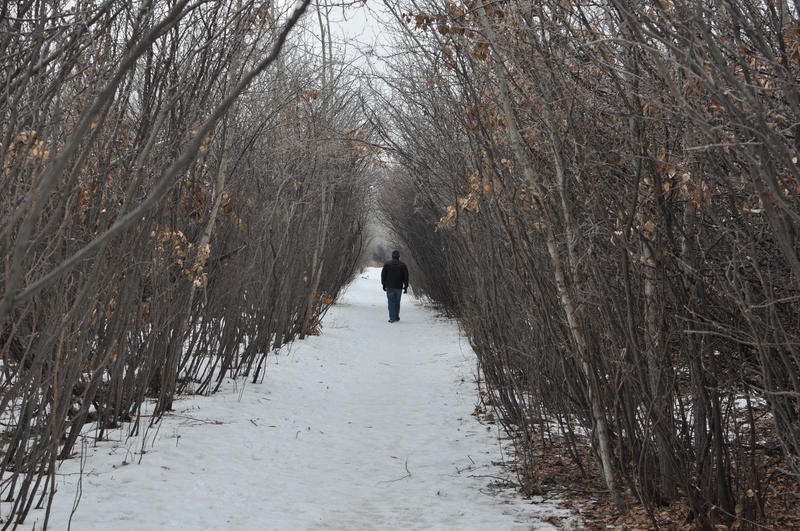 We were walking sans enfants, and there were things to photograph and it wasn’t 30 below. It was the outdoors equivalent of winning the lottery. We arrived at the ‘tunnel’, which appeared more ‘sparse’ than ‘magical’, but still I asked the professor to walk ahead of me so I’d have a subject for my photograph. ‘Walk in a reflective manner, not an I’m-so-miserable-I-can’t-stand-it manner,’ I directed, noting his slumping shoulders. 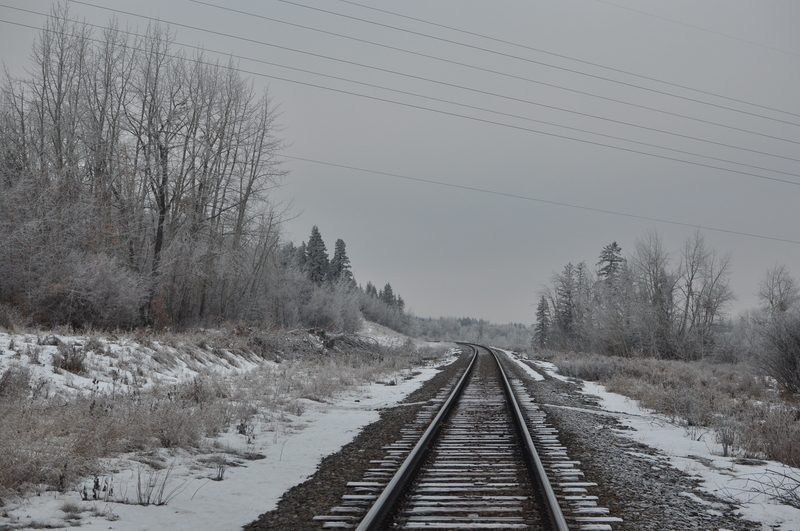 I convinced him to make a (slightly longer) loop back along the railroad tracks, rather than retrace our steps. We meandered along the stark landscape, with his fervent shivering as our soundtrack. ‘I think I’d rather be walking with Percy,’ I sighed aloud. This was, of course the truth, but like I’d said earlier: once I’m out, I’m out – fully aware that it may well be the last time. Ever again. I’d fallen a few steps behind and by the time I caught up with him, the professor was standing sideways, ostensibly trying to shield me from seeing something. A dead bird? Pile of excrement? 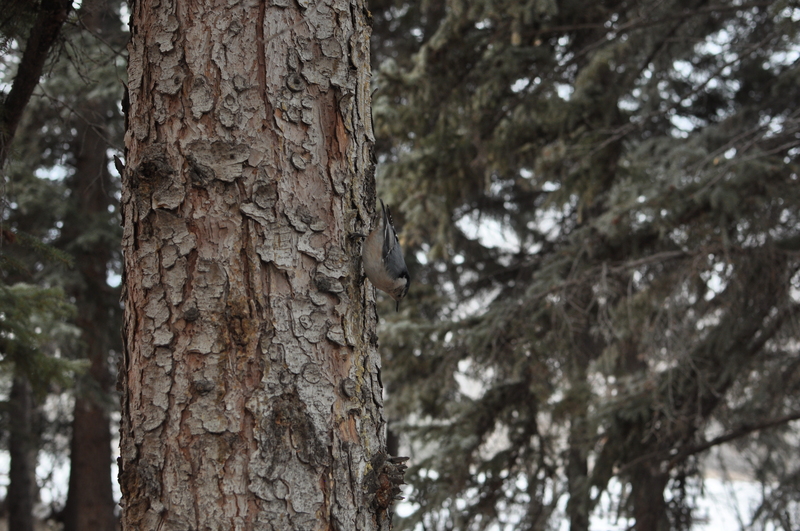 ‘What are you talking about,’ I tried to peer past him to see what he was so obviously trying to hide. ‘I think I have hoar frost on my stitches,’ he lamented minutes later, referring to the three stitches on his leg where a mole used to live. By this point I was completely freezing, thoroughly regretting my ‘slightly longer’ loop, desperately willing the parking lot to appear. 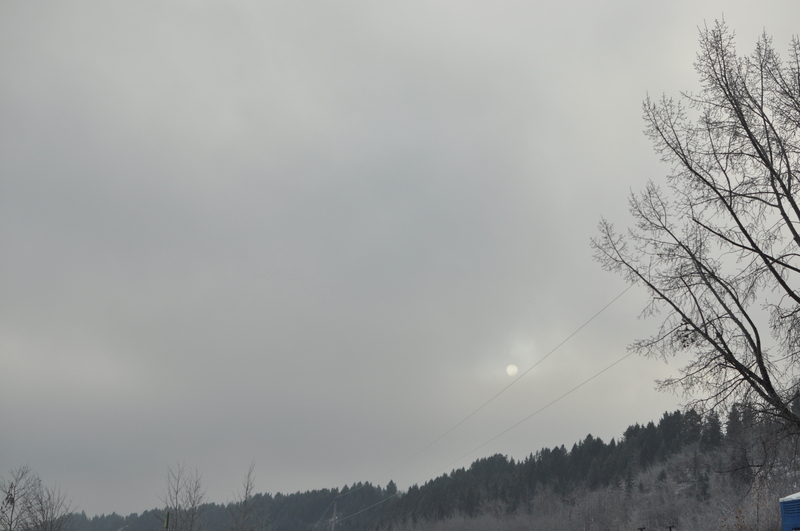 The pale sun, barely visible through the cloudy sky, caught my eye and I aimed my camera upwards. Apparently, while I was thinking about composition, the professor fell on a patch of ice. Or so he told me by the time I caught up to him again. ‘Yeah, I don’t think you could even watch that movie now. You’re all, ‘I’ll give it ten minutes.’ You have the attention span of a 17 year old,’ he retorted. This particular gem was courtesy of my showing him a Jimmy Kimmel video clip just before we left and turning it off after three minutes because it didn’t amuse me. ‘I’ve just concluded I’m not going to live very much longer and I don’t want to waste my time watching things that aren’t good,’ I shrugged unapologetically.